Disaster response falls under the broader category of Emergency Management. Disasters that occur can be both natural or man-made. P4 Security Solutions has a staff of highly trained and knowledgeable law enforcement/security professionals who can help you mitigate the impact of traumatic events should they happen in residential, corporate, commercial or public settings. Here are just some of the disaster response environments in which P4 Security Solutions has had extensive experience. Our Emergency Response Teams (ERT) are made up of highly trained and experienced security professionals, including active and retired police officers, specialized military veterans and other law enforcement subject matter experts. P4 Security Solutions has had the privilege of protecting and providing security services to many different sectors and industries. When man-made, traumatic events are anticipated, it is best to be proactive when planning for them. The dedicated teams at P4 Security Solutions can help you assess potential security threats and take action ahead of time to minimize damage to property, interruption of business operations, protecting brand/reputation or injury to people. The severity of natural disasters can’t always be predicted, but it is important to be ready to react to such events by obtaining the resources of experienced, security professionals. 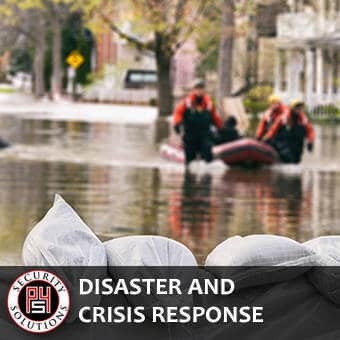 No matter the nature or scale of challenging occurrences, the professionals at P4 Security Solutions will partner with you to achieve the best possible disaster response outcomes, from both a short and long term perspective. Contact us today to learn more about how we can implement a disaster recovery plan for your family, business or organization.